Animal rescuers truly are some of the most dedicated, generous, loving individuals I have ever met. The lengths to which some of these people will go to help animals is so inspiring, it’s actually helped restore some of my faith in humanity. Covering animal welfare and cruelty issues like I do, I have often found myself losing that faith when I see how human beings continue to abuse and enslave animals throughout the world. But then I get to connect with special people who value and appreciate animals, who see non-human species as beings deserving of respect and compassion and freedom from harm. Like me, they just want to make a positive difference in the lives of innocent creatures. The following story is a perfect example of people willing to go the extra mile to help an animal in need, regardless of the obstacles or odds against them. 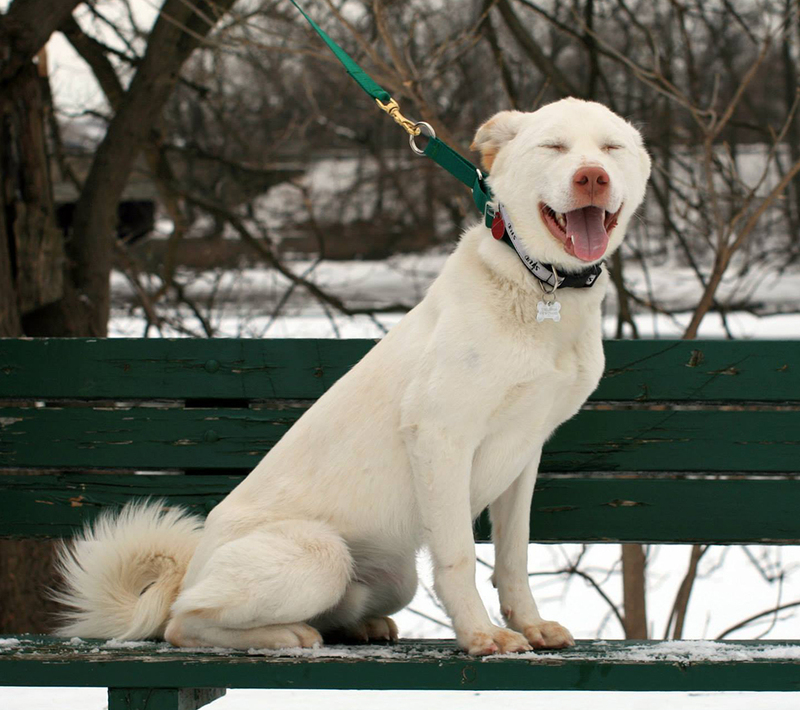 It’s the story of a traumatized Korean Jindo mix dog named Alex, who was given a second – and a third – chance at life, thanks to a kind-hearted savior and an amazing rescue organization that refused to give up on him. They are the true heroes of this story. When Craig Petronella first met Alex, he was a scared, dirty, skinny little puppy confined to a filthy crate. The little white pup was only eight weeks old, yet he was already living with his second abusive owner. As a U.S. Service member stationed in South Korea, Petronella would regularly pass by little Alex and couldn’t help but notice the pup’s sad situation. Being confined to a filthy crate 24/7 is no life for a tiny puppy, but in Korea, it’s actually common practice to crate or chain dogs outside indefinitely, with little human contact and minimal care. One day, Petronella found out that Alex’s owner no longer wanted him and was ready to either sell the pup to dog meat traders or abandon him to the streets. South Korea is home to a thriving dog meat trade that murders approximately 2 million dogs each year, so whether he was set loose or sold, the pup appeared doomed to end up on someone’s dinner plate. But the kind military serviceman wasn’t going to let that happen. After convincing Alex’s owner to let him adopt Alex, Petronella brought the pup home during one of his leave times to live with him and his family in Virginia. The Petronellas were experienced dog owners, so they assumed that with a little love and patience, Alex would soon forget his abusive past and begin to enjoy life as a beloved member of their family. But sometimes love isn’t enough when it comes to rehabilitating an abused dog. 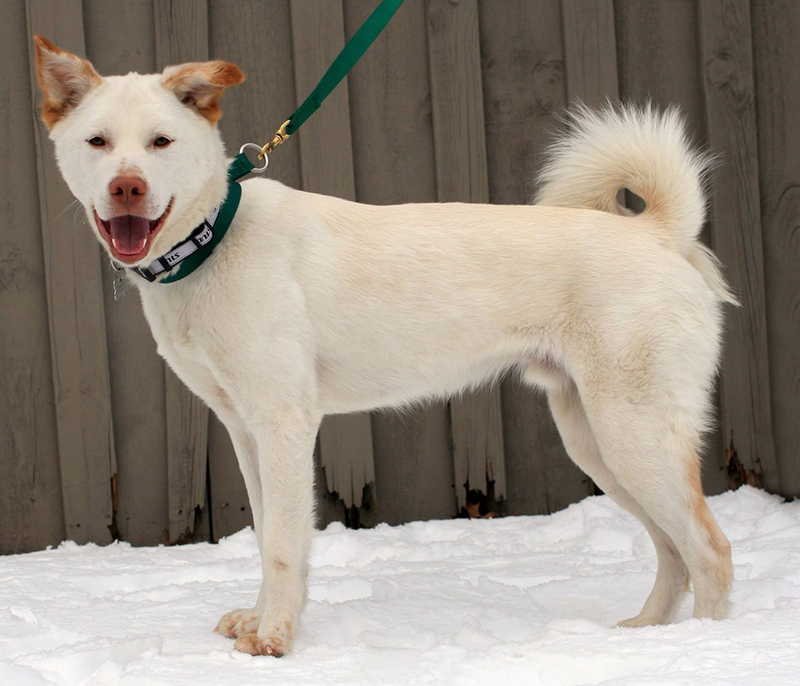 Due to his early trauma, the young Jindo mix suffered from deep-seated fear issues that began to worsen as he grew. When confronted with anything that frightened him, such as fast movements, loud noises or strange people, the dog would “shut down” by trembling uncontrollably, pressing his eyes tightly shut and cowering against the ground, paralyzed in fear. If he couldn’t hide, he’d act out aggressively. Though the family loved Alex and tried their best to train and work with his issues, they finally realized his growing problems were beyond their scope. With no one willing to adopt the troubled eight-month-old pup, the family feared they would have no other choice but to euthanize him. But not willing to give up on Alex until they had exhausted every last option, the Petronellas reached out to a rescue organization they hoped would be his saving grace. Enter Treasured k9s, a nonprofit organization that specializes in rescuing and rehabilitating Jindo dogs throughout the east coast region. Since their founding in 2008, this rescue has saved, rehabilitated and re-homed approximately 70 Jindos, many with behavioral challenges that most rescues would not want to deal with and shelters would simply euthanize. But then, this type of dog isn’t meant for the inexperienced dog owner. 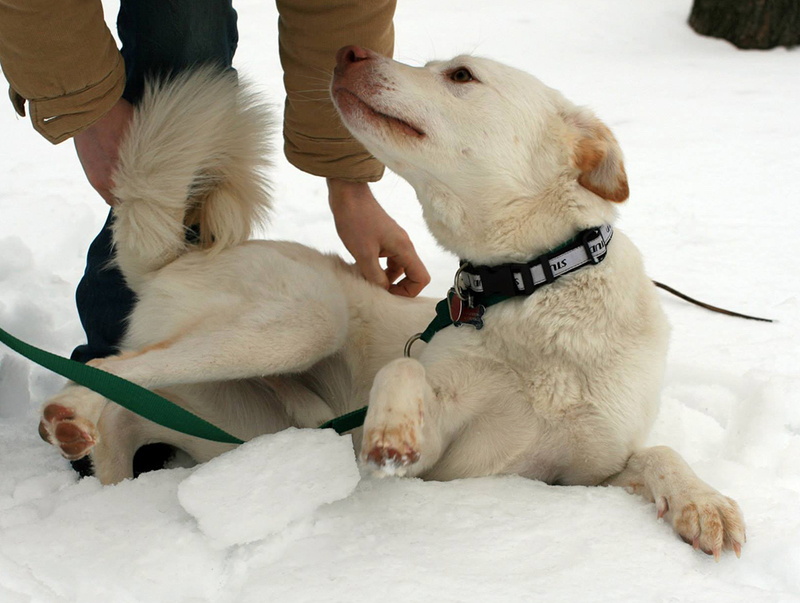 A white purebred Jindo. This magnificent breed also comes in “yellow,” black and tan, brindle and solid black coat colors. Photo credit: Treasured k9s. As a rare, primitive breed originating from Jindo Island, the Korean Jindo is a magnificent, highly instinctual dog originally bred for hunting and protection. While they are revered as Korea’s national treasure and considered status symbols throughout Korean-American communities, indiscriminate and irresponsible breeding combined with inexperienced dog ownership has resulted in more and more Jindos meeting their deaths in U.S. shelters every year, Kristen Edmonds, founder and president of Treasured k9s, explained to me. Because they’re naturally protective and territorial, Jindos typically don’t do well in shelter environments, becoming fear aggressive and thus, un-adoptable. And that’s basically a death sentence for this complex, misunderstood breed of dog. Alex having a zen moment. Photo credit: Treasured k9s. But Kristen wasn’t going to let Alex meet that sort of end. Figuring he was at a prime age to overcome his issues, she agreed to take him on and headed straight for New York-based Dog Behaviorist Jeff Kolbjornsen, who estimated the young dog would need a couple of months of training and rehabilitation to help build his confidence and learn to trust people. But once Alex was evaluated, it became obvious that not only was this process going to take more time, it was also going to be more challenging than expected. Plus, the trauma of being separated from his family wasn’t helping matters, explained Kristen. Here he was, in a strange place with a strange man (he was very sensitive to men to begin with) and all these new people – the nervous pup was simply terrified. But after six months of daily socialization and rehabilitation – to the tune of $20,000 – Alex had slowly blossomed into a happier, more well-adjusted dog. Yes, that training bill had cost Treasured k9s a lot more than they’d planned, but seeing Alex playing nicely with other dogs, being more at ease with new people, obeying commands, and understanding his role and hierarchy in human relationships was worth every penny, Kristen said. Alex enjoying a good scratch. Photo credit: Treasured k9s. Kristen should know. 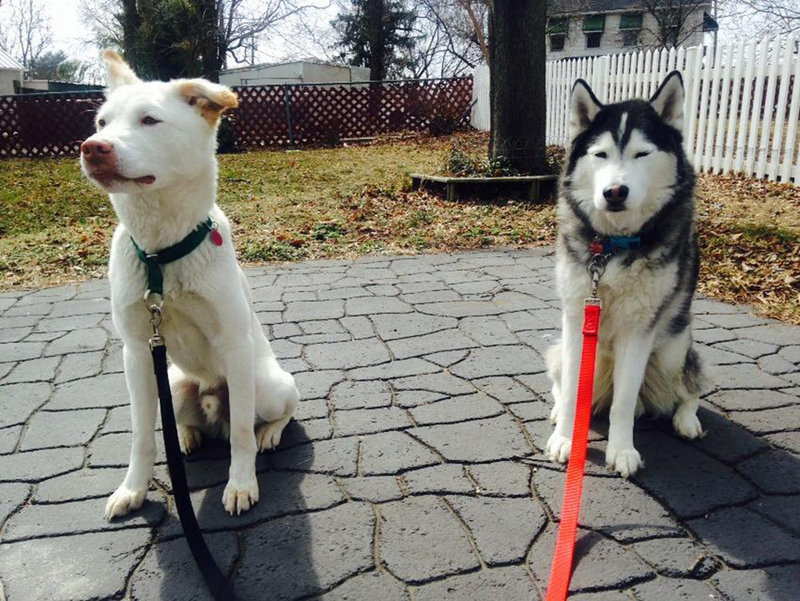 She began rescuing Jindos by accident after volunteering with a Siberian husky rescue that sent her a foster dog who appeared to be a small white husky but turned out to be Jindo mix. Plus, her mother-in-law is Korean, so Kristen has a strong understanding of the culture and where these dogs originate. Intrigued, Kristen began to research Jindos and how they were becoming more prevalent along with the increasing South Korean population in the U.S. After realizing there were only two small Jindo rescues in California (a state where homeless Jindos are the biggest problem), Kristen saw a need for a breed-specific rescue that could cover the eastern U.S.
With his formal training completed, Alex arrived at his foster home, where he adapted quickly. But when the family’s Jindo began displaying aggression toward him, Kristen moved Alex to a second foster home, where he has remained and been thriving ever since. Now over a year old, he is simply waiting for the perfect forever home, one capable of providing him with structure, rules and boundaries. While Alex still reacts fearfully to loud noises, he is no longer fear reactive. Still, whoever adopts this sweet boy will have to understand that working through his fear triggers will probably be a lifelong process, advised Kristen. Alex and his foster brother, Cosmo. Photo credit: Treasured k9s. Alex’s ideal home would also be one without cats or children, although older, calm and dog-savvy kids in an experienced home could work, Kristen said. His new family will also need to live in the New York Tri-state area, as this will allow Treasured k9s, along with Kolbjornsen, to act as an ongoing support system, if needed. Meanwhile, Alex’s foster mom, Amanda, has been doing a fabulous job continuing his training and building his social skills, including challenging him to overcome some smaller fear issues. Ultimately, Alex deserves a patient, loving, forever home willing to do what it takes to help the overgrown pup become the wonderful dog he is destined to be. 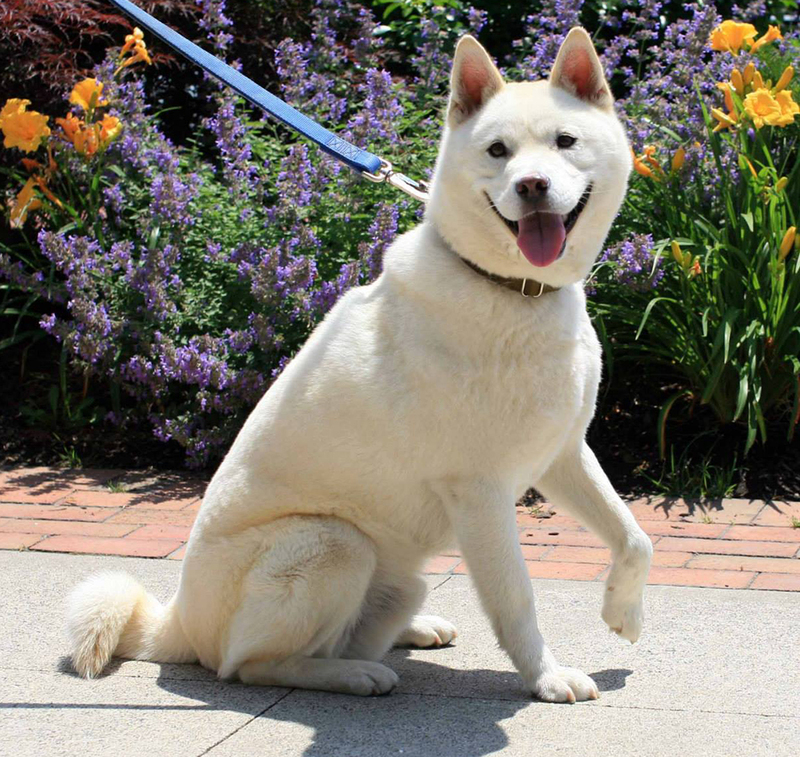 The once-mistreated Jindo mix is living proof that even the most difficult rescue and rehabilitation cases deserve a second (and a third) chance. Just a big puppy. Photo credit: Treasured k9s. Sometimes it takes a village to save an animal, and in this case, that village succeeded beyond any expectation. Treasured k9s is in dire need of donations to help with Alex’s remaining $10,000 training bill. 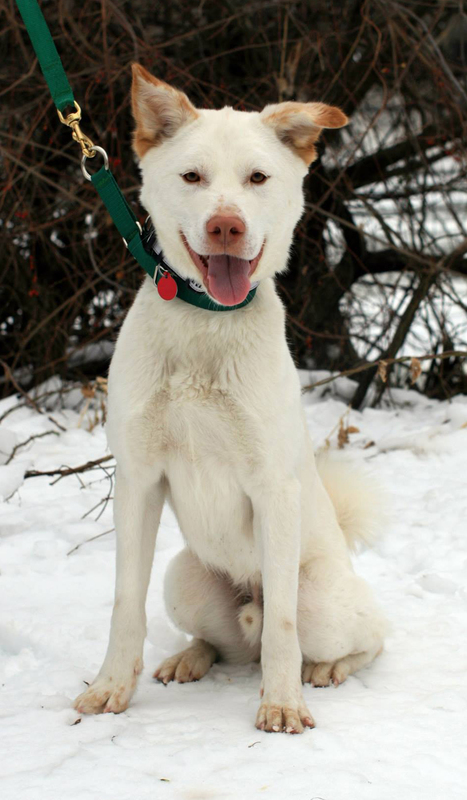 If you’d like to help this wonderful organization continue saving and rehabilitating more Jindo and Jindo mix dogs like Alex, please visit their website donation page. Also, if you live in the New York Tri-state area and think Alex might be the right fit for you (and vice versa), please visit the Treasured k9s website and fill out an application today! You can also learn more about this great organization and their dogs on Facebook. As he got closer, he noticed that the figure was that of a young man and that what he was doing was not dancing at all. The young man was reaching down to the shore, picking up small objects, and throwing them into the ocean. This entry was tagged animal welfare, dog rescue, pet rescue. Bookmark the permalink. It’s egregious the cruelty we humans do to our animal family….another form of child abuse, only not with humans!! So it’s doubly wonderful to see how caring and kind are the people you’ve described who have come to Alex’s rescue! A beautiful piece of writing….